Some music is almost timeless, and I was slightly taken aback when this album came up as 40 years old this year! In 1977 I was just 'getting into' Genesis, and I bought this album purely and simply because Phil Collins played drums on it. I knew nothing of 'jazz fusion', or even of jazz in its purer forms. This was to be an awakening for me. 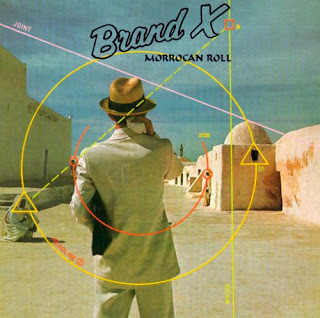 This is Brand X's second album, following on from their 1976 debut, 'Unorthodox Behaviour', recorded and mixed between December 1976 and February 1977, around the time that Phil Collins was working on 'Wind & Wuthering' with Genesis. It reached number 37 in the UK album charts, the band's highest chart position. The Indian influences in 'Sun in the Night' worked well for me then. I was a bit of a hippy (probably still am, though without the hair and the green paisley kaftan! ), and any eastern references were lapped up, and the combination of electric sitar and lyrics in Sanskrit fitted my world-view perfectly - good grooving music! 'Why should I lend you mine...' is a chilling tune, and Percy Jones's bass licks early on still send shivers at times. It was music like this that began to show me just what standard rock instruments were capable of in ways I was not previously aware of. '...Maybe I'll lend you mine after all' is led by a simple motif on the piano, by Phil Collins, and is a gentle, dreamy, simple tune: almost an afterthought. 'Hate Zone' has a funky edge to it, and is almost a battle for supremacy between bass, guitars and keyboards, with the drums keeping it all together. Side one (in vinyl terms) ends with 'Collapsar', a short, keyboard-only piece by Robin Lumley, which is OK, but doesn't seem to go anywhere in particular. 'Disco Suicide' is more standard jazz fusion stuff, with some interesting off-beat ideas musically, changes of tempo and the introduction of latin rhythms. It has echoes for me of the work of Weather Report, that I was to discover later, and the vocalised section towards the end brings a nice lyrical quality to the tune after some of the 'chaos' of earlier. 'Orbits' sees Percy Jones playing around with his fretless bass, and an autoharp, through effects pedals to produce a short, space-y soundscape. 'Malaga Virgen' is perhaps 'more rock and roll' (Moroccan Roll) than anything else on the album, but in saying that it loses none of its jazzier, more experimental edge: while Goodsall is laying down some heavy guitar sounds, the bass is much higher in the mix and dominates, but there is scope for much toe-tapping and even head-banging in places. But the tempos continue to change, and soon there's pensive bass, thoughtful piano and quiet acoustic guitar, before the pace increases again. It is easy to see how this quickly became a live favourite. Album ender 'Macrocosm' starts off as a deceptive 7/8 song which drifts off on occasions into strange rhythmic hinterlands before morphing into a more rocky piece in 4/4, but never settling in one signature for long. The musicianship throughout this album is exemplary: all five of the musicians exhibit an excellence and dexterity that one has come to expect from this genre, but perhaps here the ground-rules were being laid down (along with Weather Report and others). This is, as I mentioned above, a timeless piece of work, and forty years on this remains one of the best examples of jazz fusion produced. It, along with its predecessor and the albums which followed, gave this (then) young rocker a taste of what might be possible with music, and that love has grown over the years, leading to a fuller appreciation of Weather Report, Return to Forever, Mahavishnu Orchestra, Miles Davis, John Coltrane and many others. I was fortunate to see Brand X live in 1980, co-headlining with Bruford, and I am delighted that the band are currently touring in the US, playing music from this and other classic albums. I'm not sure the 16 year-old me knew what to make of this complex music, but its influence had a lasting impression, and the 56 year-old still finds it energising, exciting and stimulating, and would commend the band's whole catalogue to anyone who is not aware of it.